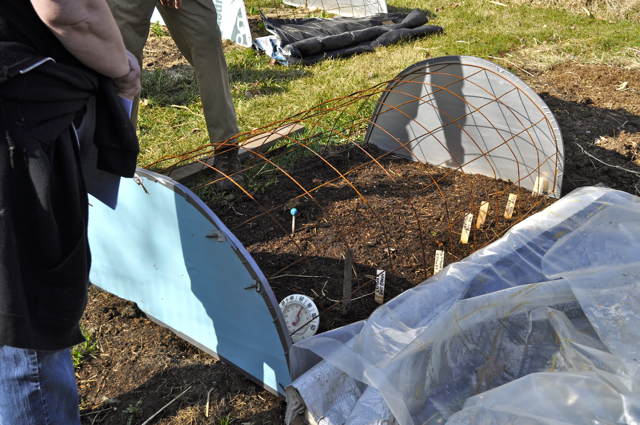 I spent a warm March morning learning how to build a mini hoop house and wondering what on earth I might need it for. The former is thanks to the early and gorgeous spring weather we've had following our very mild winter. The latter is thanks to the 70° weather that made me wonder who was I kidding, there wouldn't be another frost until sometime next October. We all know this isn't true however, because Wisconsin is known for its finicky weather, and we very well could have a frost through late May. 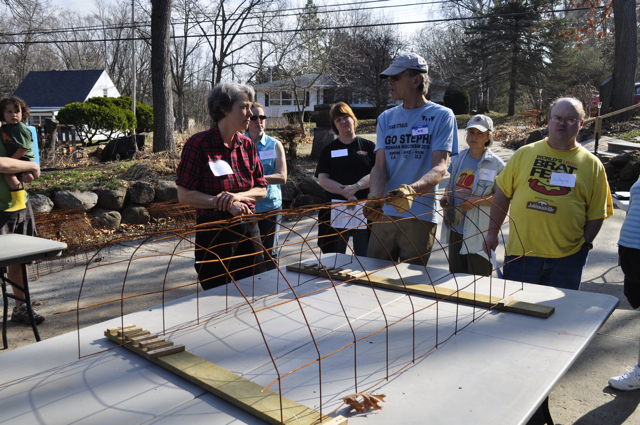 The class was presented by Fitchburg Fields, an organization dedicated to creating a center for teaching and practicing small-scale, organic agriculture and sustainable living in the Madison, Wis. area. These are called mini hoop houses because they are about 5 feet wide, a couple feet tall, and can be made as long as you like. One normally thinks of you hoop houses as the big greenhouse types that I visited at Tipi Produce earlier this month. I signed up not exactly sure what the dimensions would be or how I would use it, but it just seemed like the next step to learning more about creating a productive garden in a small space. Editorial note, Jay and I sold our house, closing on April 30, so making my 10' x 10' community garden plot uber-productive is suddenly even more important to me. I drove to the home of Nox Seehafer in Fitchburg and was greeted by Phyllis Hasbrouck, chair of Fitchburg Fields and a familiar face. I met Phyllis at last year's Community Action Coalition autumn harvest potluck. I also immediately spotted my colleague Susie Roessler who is on the American Family Community Garden steering committee - she leads the events and education programs. We ended up working together to build two hoop houses. We started by walking through Nox's backyard, where he had several hoop houses already in use. 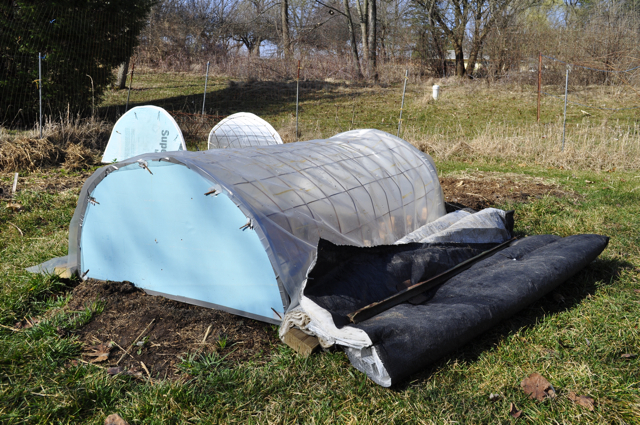 One bed had direct sown seeds and when Nox pulled back the plastic glazing, we could see it was 70° inside. You can see it for yourself on the round thermometer in the picture. Nox also pulled out a ground thermometer (that's the little stick with the blue ball on top of it in the bed) but I don't recall what the soil temperature was. In another bed Nox was growing various leafy vegetables such as spinach that were thriving in the microclimate. Nox then took us to his driveway where he had already set up several stations for us to make our own hoop houses. 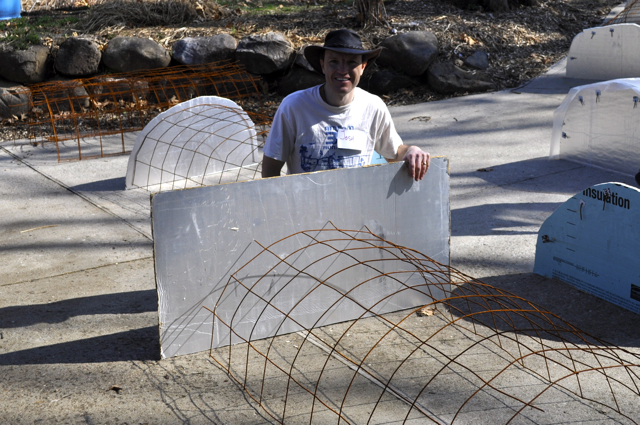 On a large table he had set up a jig to shape the wire structure into a half dome. He had already precut and shaped hoops for all of the participants. After showing us how to shape the half domes so we could make more at home, we moved to the next step. Nox had trimmed every other horizontal support on the hoops, leaving some sticking out the ends to punch through a piece of one-inch construction foam. He then trimmed the foam around the hoop, leaving about an inch above the metal frame. 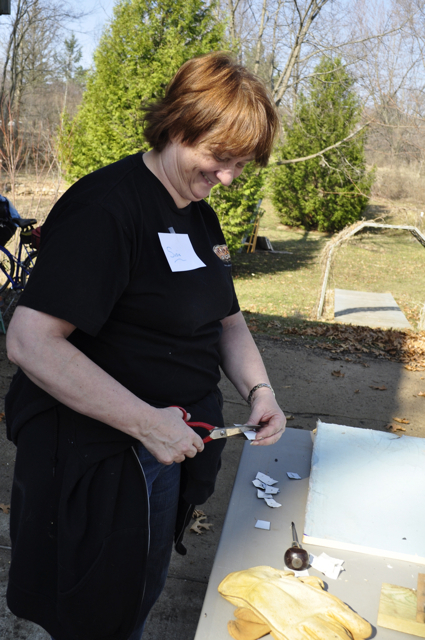 My colleague, Suzie Roessler, cutting squares of a super-sticky adhesive tape. We then punched a hole in the middle of the squares and slid them over the protruding wire to seal the hole and help prevent the wire from wearing through the foam. Around this point I looked up and saw one of the younger participants checking out the inside of one of the houses. He didn't seem all that bothered. 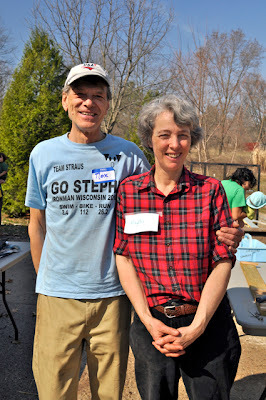 Suzie and I then met Jim Lorman, Edgewood College biology professor and academic program director, and his wife Anne. When Jim overheard that Suzie and I worked at American Family, he introduced himself and told us that Angela Freedman (the American Family community garden co-chair with me) was in his class when she and classmate/colleague LeeAnn Glover first proposed the community garden more than a year ago. 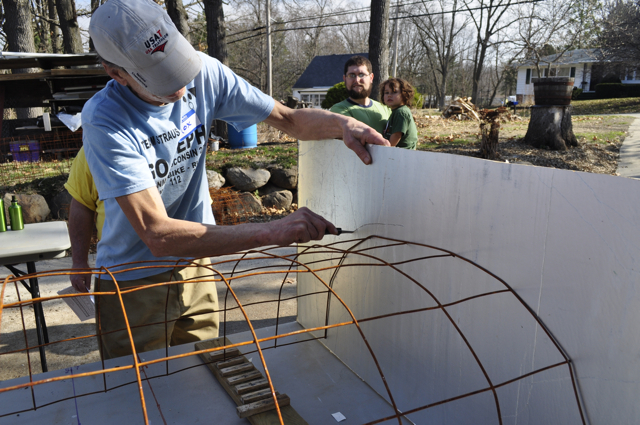 The final product was a very light-weight structure to protect a garden bed against frost in the spring, to extend the growing season into the autumn, or even to overwinter crops such as carrots, parsnips, potatoes or even brussels sprouts that had been trained to grow horizontally. It can also overwinter spinach, Swiss chard and kale. 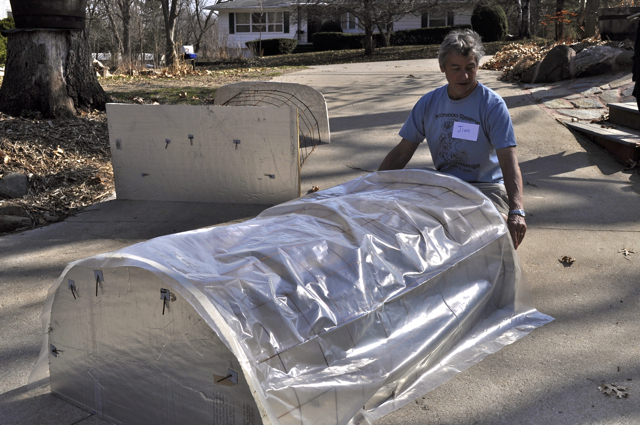 While things won't actually grow in the winter, the plastic glazing and insulating blanket will create a hospitable place free of snow that can be uncovered and harvested from any time of the winter. As I mentioned, Jay and I are moving, and as it looks today, we will be living in an apartment until we find a house to buy. 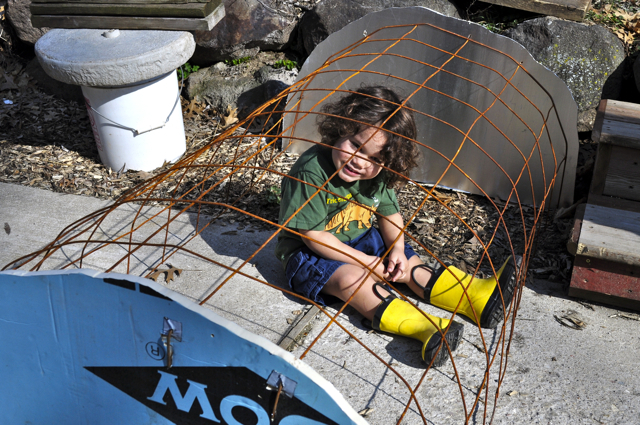 I strapped the assembled frame to the top-carrier of Jay's car, but I wasn't yet sure how I wanted to incorporate the mini hoop house into our community garden plot. So I offered it to my friend Diane who is, bless her heart, babysitting my seed starts in her basement because I will be out of our house well before I can put plants in the ground. 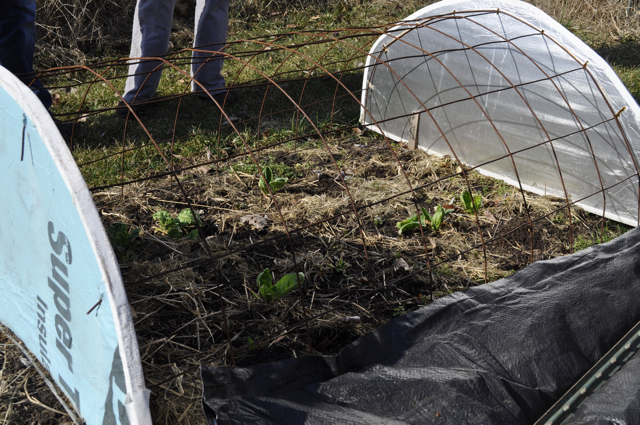 She's going to use the hoop house this spring to harden off our plants, which is something Phyllis told me she does for all of the seedlings they plant at Fitchburg Fields. The class was a lot of fun, and with these pictures, you just may be able to build your own many who posts.